Response: After Silver Twilight Temptress is committed to a story on your turn, choose a character without an (I) icon. That character must commit to the same story as Silver Twilight Temptress, if able. Flavor Text: "Come into my web, said the spider to the fly." One of my favorite cards in Magic: the Gathering is Sleeper Agent. 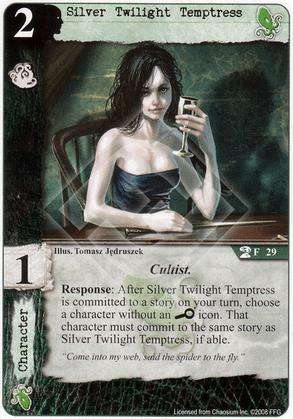 I don't know what the artist's intent was for Silver Twilight Temptress, but it seems like it might've wanted to be more like the art for Sleeper Agent. I've tried to find something about the Temptress's shadow that gives away her true nature, but nothing stands out. That said, I literally just noticed that she has a dagger on the table underneath her other hand, so that's pretty cool. Whether intentional or no, the angles of the shadow are all wrong. Her chair's shadow is just above the chair, so why is her shadow below her? It looks like she is leaning down to drink in the shadow realm, but her body is straight up and she is holding out her cup. Her shadow also looks vaguely inhuman, but is that just her hair? It's vaguely unsettling without being obvious. Oh, and she has a dagger.